Call24 TRBO is the Call24 interface and operational software that supports Call24 call box integration into MOTOTRBO systems. Alarms and security communications are enhanced in schools, healthcare, commercial, industrial, or government sites when using CALL24 call boxes that have been integrated into MOTOTRBO RF Systems. Call24 TRBO provides a quick and easy way to upgrade existing and new Call24 Mk-1 and Mk-III call boxes to digital radio. Instant reporting of alarms and security issues to on- or off-site personnel using existing radio infrastructure. Mobile or dispatch monitoring and control. 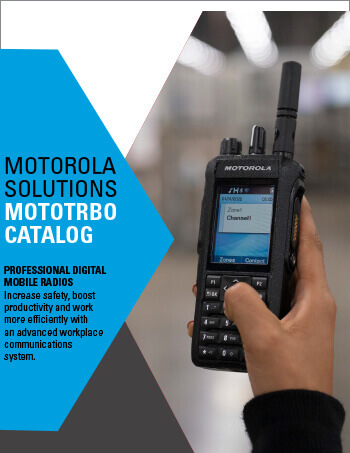 Allows enhanced functionality to Motorola’s Digital Radios by allowing DTMF control through the radio channel. No trenching or boring of communication lines. Interfaces: XPR or APX series. Quick 2 Second Alerting, Quick Two-Way Communications. Conventional Digital, IPSC, Capacity Plus, Connect Plus. Mining, Oil & Gas, National Government Security, Public Services (non Public Safety Government) Transportation & Logistics, Utilities. FirstPAGE product family provides a hardware/software bridge between Alarms & Events that occur in Industrial applications, equipment, systems and provides production critical textual information to MOTOTRBO portable and mobile radios, PCs and smartphones with an optional WAVE client installed. This real-time information enables hourly and salaried workers to make better informed decisions that positively impacts productivity, quality and profitability. Leveraging Industrial manufacturing partnerships with companies like Aptean Activplant, GE, Rockwell Automation and Schneider Electric allows SeQent to integrate with their products and indirectly connect them to the MOTOTRBO platform. This is a key differentiator from other ADP solution providers and is aligned with Motorola Solutions corporate Industrial Internet of things (IIoT) strategy. Aligns with Mobility & Industrial Internet of Things (IIoT) Strategies. Automated message throttling to preserve radio network bandwidth. Delivery to SUID (portables/mobiles) or TGID (Talk groups). Connect Plus - XRC 9000 or XRC 9100.
non-Connect Plus - XPR 8380, XPR 8400, SLR 5000. Windows 2K8, Windows 2K8R2, Windows 2K12, Windows 2K3, Windows 8.x, Windows 7.x. Compatible with Conventional, Capacity Plus, Capacity Max, Linked Capacity Plus, IP Site Connect and Connect Plus. Mining, Oil & Gas, Manufacturing, Transportation & Logistics. TRBOnet software for Generic Option Board enhances digital radio network with automated telemetry and emergency response as well as helps to receive detailed data uninterruptedly with minimum time intervals possible. Swift Event logic consists of three main components – Events, Conditions and Actions. A radio unit can operate in a more self-sufficient manner thanks to the product. Control and monitoring is possible without connectivity to the RF system or if the dispatcher is not available. If undesirable activities are detected the radio unit can send a report to the dispatch console. Increase radio unit self-sufficiency by programming it with Geofence zones and rules that govern speed and location control. Switch between channels automatically when changing zones or when a specific activity is detected for continuous connectivity. Customize radio tones, activate built-in telemetry and display messages for effective notifications. Conserve the RF capacity - frequent GPS updates are not required since the radio saves all data and monitors itself. Georoaming & Geofence for uninterrupted connectivity and location safety. Data storage in case of connection loss or unavailable RF channels. Programmable sequence of actions for automated response. Compatible with IP Site Connect, Capacity Plus and Linked Capacity Plus 2.5 or above. The Tallysman TW200 SCADA Device provides secure and reliable end-to end SCADA and Telemetry communication over Motorola MOTOTRBO™ radio systems. The TW200 provides serial port (RS232) pass-thru connectivity for Remote Terminal Equipment (RTU) and Supervisory Control and Supervision systems (SCS). The TW200 support 300 byte data payloads. Transmissions are triggered in response to a SCS poll or an autonomous alarm event triggered by an RTU. The time to complete a typical system poll and receive a RTU response is less than 3 seconds. The SCS Control Station radio is configured to “broadcast” messages in a point to multi-point configuration. RTUs receive all messages and respond only if the data payload addressing matches their own. Polling or autonomous event reporting. Secure Communication maintained by a watchdog timer. Transmissions triggered on ETX or character time-out. All MOTOTRBO network configurations supported. XPR 4000, 5000, 6000, 7000 series compatible. Mining, Oil & Gas, National Government Security, Utilities.